All 13 demonstrators were handcuffed and taken into custody about 8 a.m. They were released two hours later with misdemeanor charges, and are to appear in U.S. District Court. If convicted, they face up to six months in prison. 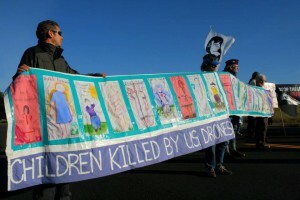 The Veterans Spring Days Drone Action temporarily blocked traffic at the two busiest gates entering Beale Air Force Base, the home to Global Hawk surveillance drones and the U2 and the MC12 Liberty aircraft, all participants in the so-called “war on terror.” They have been complicit in the deaths and injuries of thousands of innocent civilians. 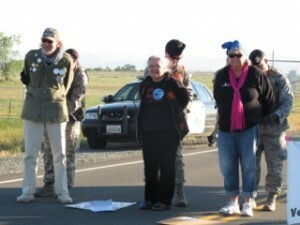 This is the largest number of people arrested in a single action at Beale Air Force Base to date. Dozens have been arrested protesting drones at Beale Air Force Base in the past year, including more than a dozen people on Ash Wednesday and Good Friday this year. Three federal trials have been held, and earlier this month a lone protester was found not guilty in U.S. Court in Sacramento.